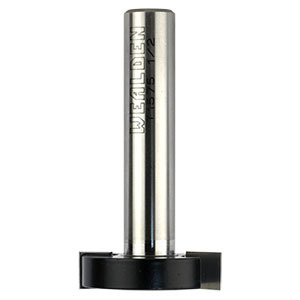 These two flute "T" slot cutters have the same dimensions as the T1560 series above, however they have a plain pilot guide in place of the slot cutters (dimension "E"). This ensures a stronger cutter allowing higher feed rates. When using these cutters a slot of the same width as the pilot (dimension "E") is cut first, then the "T" slot is cut with the pilot following it. Cutter number T1578-8 is specifically designed for the commonly available 6mm SLOT BOLTS, which are useful in jig making.